The aura is the electromagnetic field surrounding an object. Some people refer to this field as a bio-energy field. In truth this aura energy field not only goes around you, but moves within your body as well. It is not just the outside of your body that is made of electromagnetic energies, every part of your and everything your experience in third dimension. They vibrate to different color, sound and light frequencies. The color spectrum varies with one's physical, emotional, mental, and spiritual states. They consist of seven levels/layers/auric bodies . Each one of the subtle bodies that exist around the physical body, has its own unique frequency. They are interrelated, and affect one another and the person's feelings, emotions, thinking, behaviour, and health as well. Therefore a state of imbalance in one of the bodies leads to a state of imbalance in the others. Some people can psychically look at the subject and see images within the person's aura. These images may include symbols/archetypes, people, digits, or even another aspect of the person's soul that is coming through in their third dimensional aura from another realm. Psychic healers see ‘whitchcraft’ effects and use dematerialisation, rematerialisation and materialization to remove the ‘objects’. All organs have their etheric double. 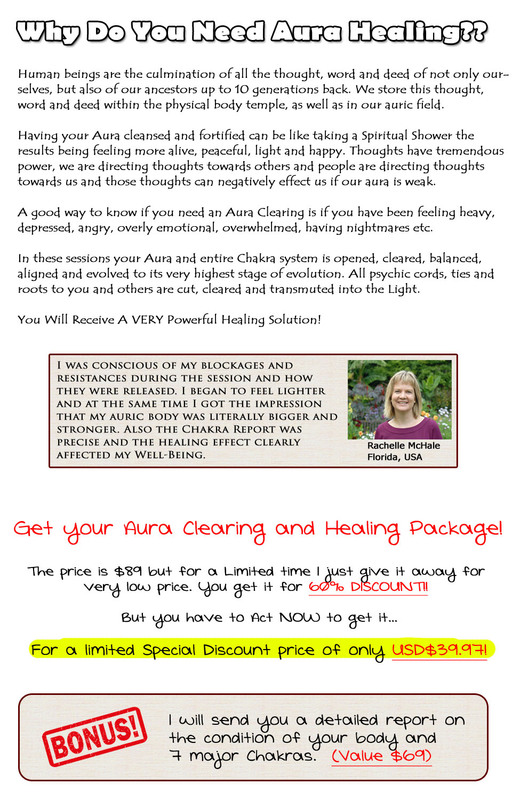 Upgrade your aura now! Click here.